Prepare for a world where agility and a willingness to innovate are not just useful extras, but central to growth. Where market leaders have the vision and technological agility to turn ideas into reality faster than the competition. On the 27th and 28th of November Meet The Boss in partnership with HPE and Wipro will be flying 10 leading IT leaders to Madrid to take part in HPE discover. The program is built to help accelerate your digital transformation by learning, connecting and building your knowledge on some of the hottest topics in IT transformation right now. This is an opportunity for Senior IT leaders to experience a very special 2 days in Madrid while working to overcome your digital transformation challenges. 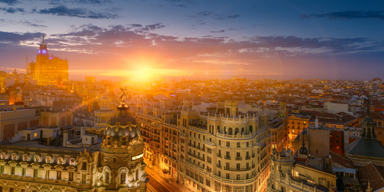 • Flights to Madrid and 1 or 2 nights Accommodation. • Invite to HPE Wipro Roundtable Discussion at Real Madrid’s incredible stadium – The Bernabau. • HPE + Wipro Real Madrid Dinner – 3-course Dinner and Drinks at the world famous Bernabau stadium. Join us, along with our 10 other C-level IT leaders, for a dedicated discussion and a very special 2 days helping you to explore new trends, build new strategies and plot a clear course for your transformation journey.